In Cavan, approximately one hour and thirty minutes’ drive from Dublin, the new crematorium is the talk of the town. On the one hand everyone talks about it because there are no other crematoria in the area except for in Dublin and Belfast, and on the other hand because the crematorium is an absolute breakthrough for Irish standards because of the high quality technology and filter system that meet all contemporary requirements. 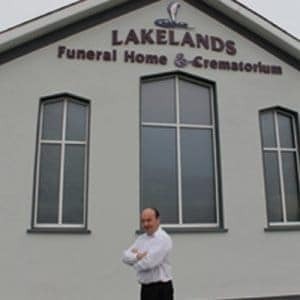 Declan Finnegan is the proud owner of Lakelands Crematorium. Once the building was approved, the renovations and construction of the cremator were started immediately. DFW Europe is responsible for the technology and the construction of the cremator, the filter installation, the insertion technology and the cremulator. The crematorium was officially opened in July 2015. About the choice for DFW Europe Finnegan said: “I have looked at many crematoria in Europe and spoken to many people. DFW Europe was recommended to me by different sources and I am very happy with our choice. The experience of working with these Dutchmen was very positive. They are involved, they help us wherever possible and they act decisively. Prior to the opening, I showed the video of the new cremator to everyone who wanted to watch it. Without exception, they were all impressed, in particular about the insertion machine. Additionally, and not unimportant, it was not hard to determine that we bought the best product for the best price”.